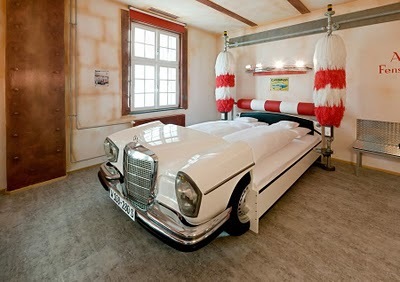 Car Themed Hotel -The V8 Hotel, named after the famous eight cylinder engine is located in the centre of Stuttgart’s Meilenwerk – a German international hub for car dealers. It offers 23 standard rooms, 10 large rooms, and a 120sqm suite. 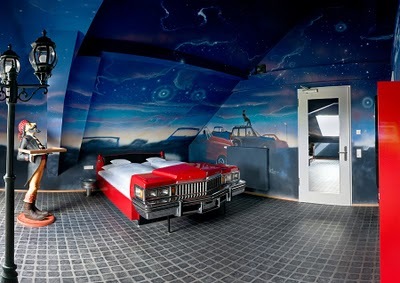 Many of these rooms are decorated with car themes that contain real cars and auto accessories. You will find here anything from classics, sports cars, a mercedes-benz car wash, 70’s cadillac drive-in cinema, and also a morris minor garage. 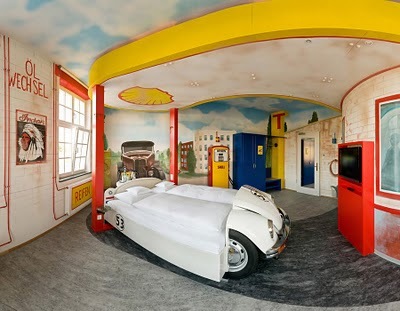 The themed rooms include a autokino (drive-in-movie-theater with a caddy bed), V8 camping room, racing (manufacturer logos and racers at the track), werkstatt (a garage with a morris and mechanic’s legs), carwash (old benz with brushes), vision (a turbine-like sleeping area), tuning (with racing buckets and a lot of tiger print), tankstelle (gas station with a herbie), and motorcycle (with an out-west Route 66 theme). This place looks like a car lovers dream, and I could see people even mildly interested in autos enjoying a stay there as well. Theme hotels are popping up all over the world, and this one looks like it has definitely found it’s niche.